A Nephila clavata producing silk. A group of scientists led by researchers from the RIKEN Center for Sustainable Resource Science (CSRS) have examined the soluble precursor of spider silk and found that a previously undiscovered structural element is key to how the proteins form into the beta-sheet conformation that gives the silk its exceptional strength. 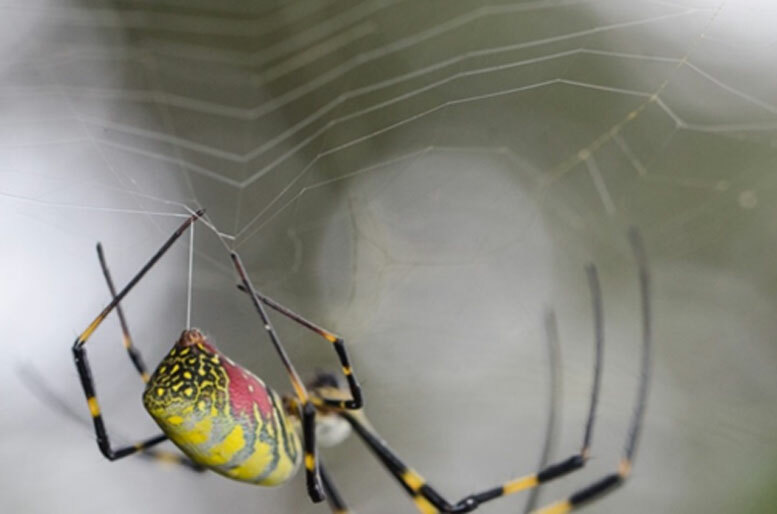 Spider silk is known for its exceptional toughness and flexibility. It is several times stronger than steel, and yet is much more flexible. As a result, efforts are being made by scientists around the world to try to develop analogues that could be used in industrial and medical applications. However, though it is known that the beta-sheets in spider silk are key to its strength, how the sheets are formed is poorly understood, making it difficult to create artificial variants. Part of the reason it is difficult to understand the mechanism is that the silk is initially created as soluble proteins, which very quickly crystallize into a solid form, and it has been very difficult to analyze the soluble form. To elucidate this, the CSRS researchers generated silk proteins using genetically modified bacteria that can produce silk from a golden orb-web spider (Nephila clavipes), and then performed complex analyses of the soluble proteins. They looked particularly at the repeating elements that are enclosed between two terminal elements that have been well characterized. They found that the repeating domain is composed of two patterns–random coils and a pattern called polyproline type II helix. It turns out that the second type is crucial for the formation of strong silk. Essentially, their studies demonstrated that the polyproline type II helix can form a rigid structure which can then be transformed into beta-sheets very quickly, allowing the silk to be quickly woven. Intriguingly, it turned out that pH–which is thought to be important for the molecular interactions of the N- and C-terminal domains–does not play an important part of the folding of the repetitive domains, and that it is rather the removal of water and mechanical forces as the precursor moves through the silk gland. 1 Comment on "Biologists Reveal Key Mechanism Behind the Formation of Spider Silk"